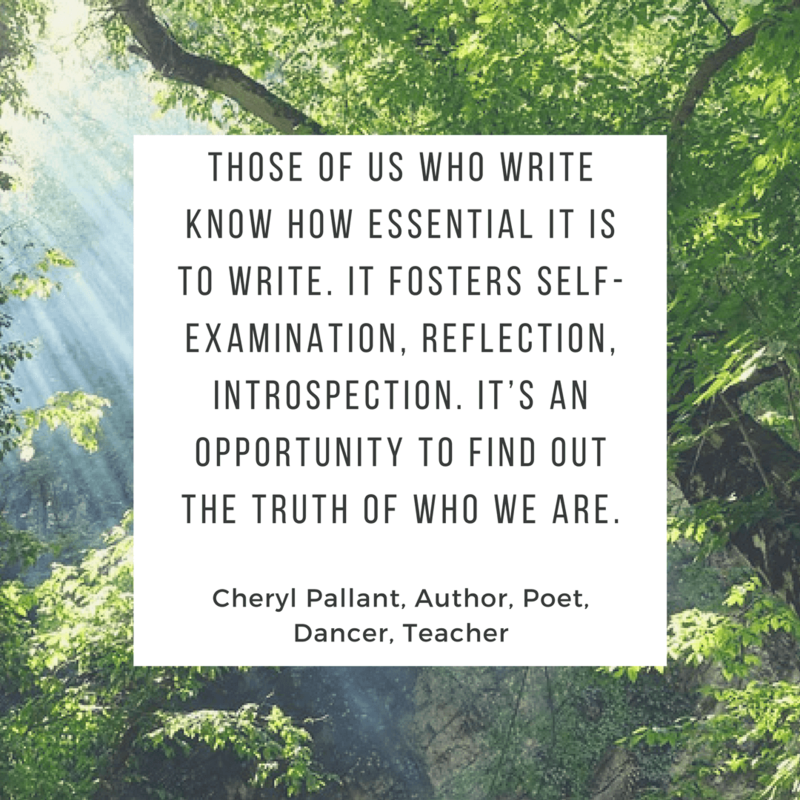 Years ago, someone told me that taking a writing class with Cheryl Pallant would be unlike any workshop I’ve ever taken, and whoever that person was—I wish I remembered!—he or she was absolutely right. Tapping into the creative energy of your body as it moves stimulates the writing mind in ways I hadn’t experienced before. Ask me, and I’ll tell you a story about the astounding mind-body connection of that first class with Cheryl seven years ago. 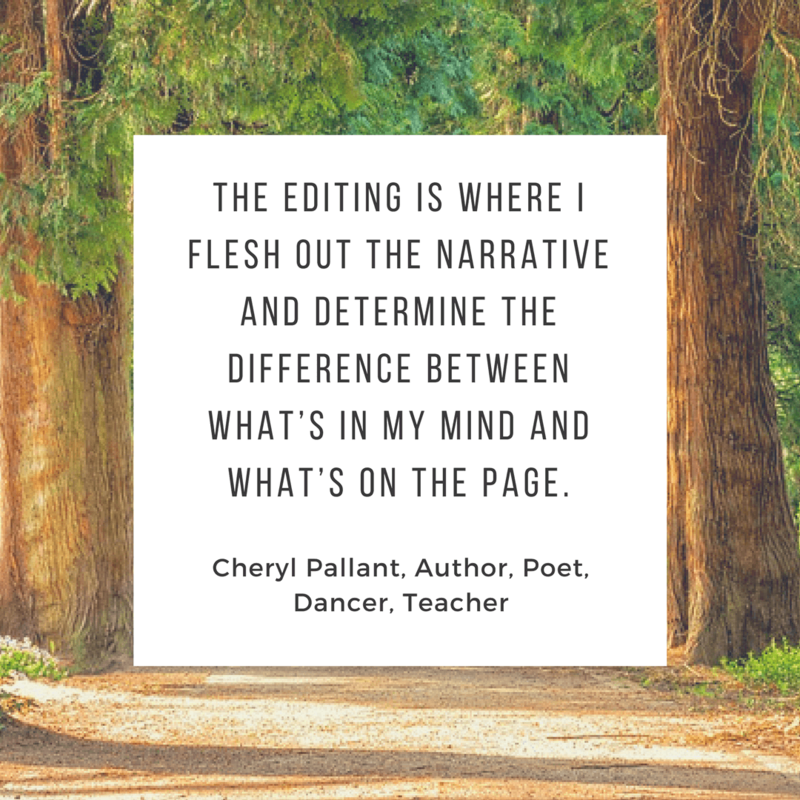 But in the meantime, I’m honored to showcase author, teacher, and creative guru Cheryl Pallant and to share her thoughts on her editing process. Cheryl Pallant is the author of several books of poetry and nonfiction, most recently Ginseng Tango, Her Body Listening, and Writing and the Body in Motion: Awakening Voice through Somatic Practice. Her stories, poems, and essays have appeared in places like New York Quarterly, Confrontation, and Fence and in anthologies like An Introduction to the Prose Poem. She teaches at University of Richmond and offers her somatic workshop, “Writing From the Body,” at retreats and art centers across the U.S. and abroad. Kris: Tell me about your editing process. 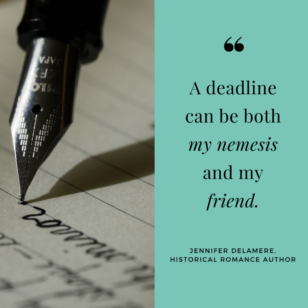 Do you edit as you write, only after you finish, or a little bit of both? Cheryl: Despite the temptation, I try to hold off on the editing until I’ve completed an initial draft. Kris: You write so many types of projects. I’m not sure there’s much you haven’t tackled. How is editing poetry different from editing a book? And is editing a memoir different from editing other forms of non-fiction? Cheryl: It helps to know that I write poetry, short fiction, long and short form nonfiction which includes a memoir. 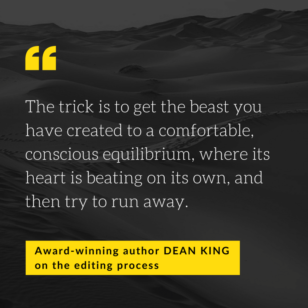 Each book, even those within the same genre, requires a different way of editing. Generally, I keep a two-step method in mind. There is Step One, which is writing an initial draft. Follow the flow of language and image. Minimize the amount of editing in this draft. Too much editing early on can kill the resonance and organic structure of the material. Step Two is the editing, which is as important a part of the creative process as the first step which focuses on flow. The editing is where I flesh out the narrative and determine the difference between what’s in my mind and what’s on the page. I edit several rounds for rhythm, clarity, structure, and image, followed by edits for mechanics, spelling, and grammar. I work a lot from a dreamlike place. In my poetry, it leads to word play, associative leaps, and precognitive knowing. The latter basically means that I don’t know what I’ve written until I read it. My poetry, specifically my first two books, Uncommon Grammar Cloth and Into Stillness, relied on a somatic writing technique that I was developing which focuses on my body primed by many years of dance and meditation. In fiction, the dreamlike place lets the images of the movie appear. I sit back, watch, and record. Then I return later to add more description and plot development. My fiction is highly visual and surreal. Details are vital to make it believable. The editing for my memoir, Ginseng Tango, required many structural changes, moving entire stories into new places, deleting some events and adding others. A challenge of a memoir is knowing which stories are pertinent to the book and which are best left out. The story deals with recuperating from divorce and adopting a new home in South Korea. I wrote quite a bit about the loss, but much of that writing never made its way into the book. It was essential for catharsis and expression but did little to forward the story of the book. A memoir writer has to know the difference. There’s got to be a focus, a narrative arc, and many elements found in fiction like plot. If a given scene doesn’t help the book, that material needs to be deleted. For instance, I was tangoing every week, but if I included every tale, it would have negatively weighed down the book. I was fortunate to have kept a journal about my many experiences in South Korea, much of which made its way into Ginseng Tango. I called upon those journal pages to assist my memory, which has its own way of editing, a.k.a. forgetting. My focus was on the shape of the Ginseng Tango with all its substories. Editing nonfiction has its own particular requirements. Clarity and linearity are paramount (compared to my poetry which is polylinear). The challenge of long nonfiction, such as my current book Writing and the Body in Motion about somatic writing, requires me to stay focused on what’s on the page and what ideas should follow logically. It’s too easy to conflate what’s in the mind with what appears on page. The mind readily fills in the blanks, whether those blanks are structural or something as simple as a spelling error. Shorter nonfiction has its own requirements. The deadlines involved in writing for a newspaper, which I did for twelve years, meant that the material got turned in by a specific time, even if I wanted to improve the material. It limited the amount of editing time. The writing required letting go, as all writing does in one way or another. Kris: Thank you for that thorough break-down! I’m especially intrigued by your memoir-writing process. Memoir itself is a unique genre, because it’s so much more focused than an autobiography and it needs to speak to a core truth that can often be difficult for a writer to bring to the surface. Do you have any advice for memoir writers on how to revise their writing bravely, digging out their own authenticity and vulnerability? Cheryl: Too often memoir writers try to write too broadly and write about too much of their life and omit the tastier nuggets. Ask yourself, Why would a reader want to read this memoir? 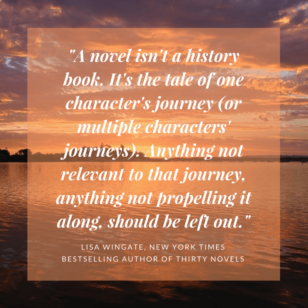 What’s in it for the reader? A good writer can make even the most mundane of topics fascinating. A poor writer can make the most riveting stories dull. Aim for the middle. Focus on the story, but also how the story is told. Let your voice come through. Allow yourself to feel vulnerable. Be sure to combine truth-telling with craft. I often write with a notebook at my side while I type away on the computer. The computer writing is the “official” manuscript. The notebook captures my thinking and raw material. On paper I tend to be more honest and sloppy. I express myself more freely. There’s something about the sensuality of my hand making contact with the page and pen. Different parts of my brain get engaged. Ultimately, much of the notebook writing ends up on the computer. A test for memoir writing is whether or not you want to read the book. Will your older (or wiser or more creative) self benefit from reading it? How? Writing, in general, is a courageous act. Writing is a soulful activity that doesn’t receive widespread support. Yet those of us who write know how essential it is to write. It fosters self-examination, reflection, introspection. It’s an opportunity to find out the truth of who we are. We get to peek beyond the masks of culture. Kris: I love that, and it’s so true. It is essential and powerful for both the writer and the reader. For non-fiction, what is essential in a finished product for you? How does a writer get there? Cheryl: I work a lot from feeling and intuition. Once I’ve said what needs to be said to the best of my ability, I stop. I come back and reread. I look for motivation to continue and to determine if the book is sufficiently shaped. When a book is done, the energy to work on it further disappears. That said, it’s important to distinguish between giving up and persisting through difficulties. One can be emotionally done, but the book may be incomplete. Taking a break from it and coming back later can suss out the difference. Kris: That’s good advice, and on a language note, I like that word “suss.” It’s not an everyday word, but it fits your sentence and your meaning perfectly. For poetry, when you’re looking for just the right word or image and you know you’re not quite there yet, what do you do? Cheryl: There are some poets who can spend months on an image or word. If the word or image is worth the struggle, if there’s something inherent about the process, go for it. I may set something aside for a day or week or month and return with more objectivity. I aim for beauty, knowing that spending too much time chasing perfection can mean that I write only one poem a year. I’ve seen myself destroy a piece with too much editing. Writing is a journey; I want it take me places, to different states of mind and being. I want the same for a reader, to have my words carry them somewhere. My poetry intentionally disrupts usual ways of reading and understanding. I want my words to bypass usual cognitive processes. With all my writing and editing, I rely on somatic techniques. I step away from the computer (and pen and paper) and do some movement and focus on body sensation. It takes me away from my head where I can run in circles and refreshes the creative energy. It supports the emergence of the right word, a new phrase or scene. We know more than we think we know; it’s a matter of getting out of our way and letting the writing take over. Kris: And in the midst of this, how do you ever know when you are done? Cheryl: When the work no longer calls me to work on it. When it wants to step out into the world. I may come back and tinker, but generally I’ve moved on to my next new writing. And when Cheryl says she’s moving on, you know that there’s real movement involved. There are so many approaches to the creative process that we have to remind ourselves that there is no “right” way to do this. It’s true for the crafting, and it’s true for the editing. As for me, I cannot sit still during the editing process for a duration of much longer than twenty minutes. When I do, my work starts to become lazy. My blood needs to flow. My body needs to stretch before I can give a project my all. We all have our ways, but ignoring the role of our physical bodies in our creative space is to ignore a core creative tool in our possession. Thank you so much for your time, energy, and wisdom, Cheryl Pallant, and happy writing, folks! Join 650+ subscribers and sign-up for my monthly email newsletter for more interviews like this.